Baiyaquan Fasteners Kit are suitable for Mercedes Benz, BMW, TOYOTA, Honda, Subaru, NISSAN, Mazda, GM, Ford, Benz and other types of cars. If the sizes and shapes meet your requirement, it also works well. They are widely used in replacement for car body clips, trim panel retainers, door trim fasteners, door panel clips, bumper clips, fender clips, engine cover and splash shield retainers. ★PREMIUM QUALITY: Baiyaquan Fasteners Kit, made of high-quality heavy-duty materials, are robust and lasting and tougher than common ABS ones, thus will not break or crack easily.They are eco-friendly, non-toxic and breakage-proof. ★12 MOST COMMON SIZES: Package including multiple sizes from 6.3mm to 10mm among total 240PCS(12 different sizes) for most uses, perfect door trim, radiator shield yoke, fender, bumper, engine cover and splash shield retainers, and replacement for Ford, GM, Audi, Chrysler, Toyota, Honda and more when you are repairing or refitting vehicles. 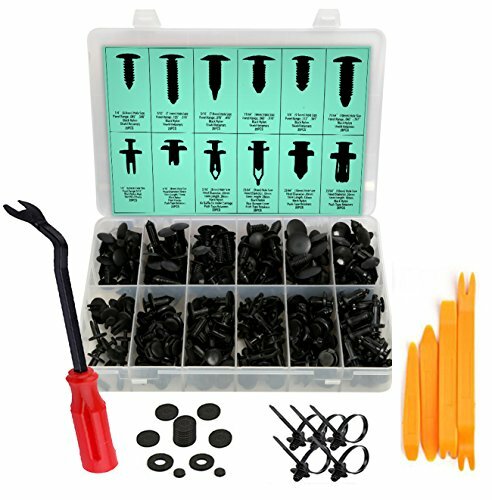 ★Bonus Clip Remover: Premium fastener remover for free, which adopted iron bar and plastic handle with high hardness, heavy-duty and durable for tough-stapled clips removing. The remover helps you to remove car door panel and upholstery clips quickly and easily without causing damage to them. ★CONVENIENCE AND NO DAMAGE: The clips are organized in separate box compartments with full listings of pieces, sizes and quantity. They are of compact size, light weight, thus convenient to store or carry with in your car. ★SATISFACTION GUARANTEED: Baiyaquan offers clear pictures for your reference. You can check the size, type and shape to make sure the item is the one you need. If there is any issue after sale such as inappropriate size& shape, please email us directly, we will offer 100% satisfactory service. If you have any questions about this product by Baiyaquan, contact us by completing and submitting the form below. If you are looking for a specif part number, please include it with your message.